I started my blogging journey with Woblogger blog on 04th August in 2014. In fast four months, I got about 20 visitors per day and within first month I made about $125. It is my first income and it is an small amount. But, it gives me a huge confidence. 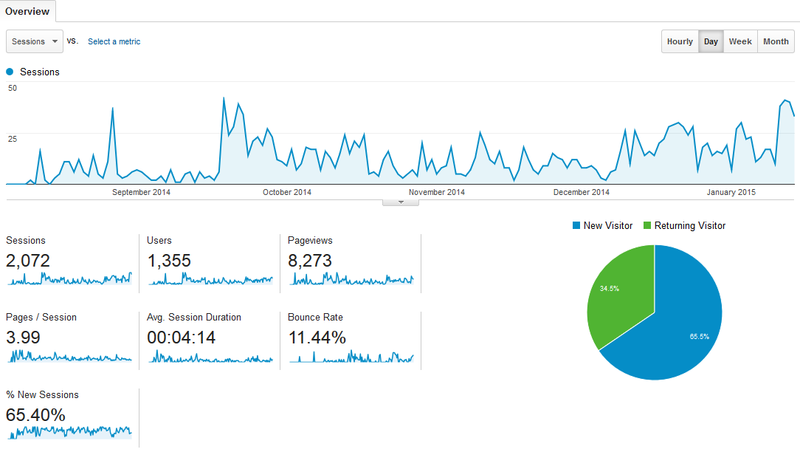 Here is an screenshot of my traffic stats. Congratulations! do you use adsense to made the 125? I did not use adsense beause of low traffic. I used affiliate marketing. Good idea. From what I see, Adsense is not what it used to be. That's a really low bounce rate so you must be doing something that your visitors want and keeping them engaged. Do you use any video on the site? Are your affiliate sales through banners, products links etc. or do you capture leads and then market to them? I thinks following reasons helps me to decrease the bounce rate. I always publish long posts. Inter-linking between relevant posts is very important. Clear design of my blog. I add links of well reputed, high pr, relevant blog posts. In some posts, I use videos. Using videos id very effective. I promote affiliate links with coupon codes, great reviews. I answers for following questions in my post. What are the benefits of that product or service? I also include product promotional videos. Could you tell some more about that? Do you just search for coupons and post them or how do you get them? Thanks a lot and good job! I am curious to know if many people subscribed to your email list as of yet? Good... I agree with you. When we choosing affiliate products we should choose them carefully to achieve more $$$$$. curious while using inter link do you choose open new window option?
" I add links of well reputed, high pr, relevant blog posts." you add others post or yours? I don't under this part " add links of well reputed, high pr, relevant blog posts. " so you mean you add others high ranking post which not your one but from others? Are you using links as events in analytics or is that a true organic bounce rate? This is my true organic bounce rate for fast four months. I saw many top bloggers have high bounce rate. That's pretty good, I usually see between 50-60% on a blog unless you have outbound links set up as events and not counting against your bounce rate. I checked it with alexa in different browsers. They shows huge variance. I didn't create and Alexa and I didn't configure my site for alexa. But I configured my site for Google analytics. Alexa is based off of users with the toolbars installed from what I can tell. There just isn't usually such a big variance. It doesn't usually matter anyway, Google Analytics is more important, I was just surprised to see such a huge different. Good job with your blog though, that's very impressive with the bounce rate. MUCH better than mine. Great job! Did you get the $125 in affiliate revenue from one sale or was this from multiple sales? I still have had ZERO success with affiliate revenue even with decent traffic numbers. My first sale is about $65 and others are $40 and $20. Good targeted traffic very important for conversion. Build traffic manually. well done you! know you'v got your feet wet and know what works it is time for you to start scaling up and start seeing the big bucks! I'd say get some more traffic then go adsense. It's going to be hard to make money from adsense but you can use it to supplement your income, but based on your current traffic you won't make much. The Bounce Rate is Amazing... Your posts may be very engaging, Do your visitors make Comments on your website's posts? Some users put comments on my posts. I usually publish long posts and I made links between posts. It is very effective method to decrease bounce rate. You can block links on comments! Interlinking articles is the best solution for decreasing bounce rate on Blog. When you write a new article try to link it with older articles using anchor texts. This way the visitors will get more articles to read and stay more time on your Blog. As the number of articles read by a visitor increases the bounce rate of the Blog decreases. Amazing! Glad to see you have succeeded with it, and your bounce rate is impressive. Wow great job! things like this are my inspiration to keep into this and try to keep my own motivation high to try and succeed into making a brand. how you get those target traffic ? Building large amount of targeted traffic is difficult. Nevertheless, I followed very simple steps to build some targeted traffic to my blog. 1. Forum posting - I posted some posts in relevant niche. 2. blog commenting - I build backlinks by commenting on high pr well reputed blog in same niche. 3. Social media - I promoted my posts on FB, Twitter, G+, Pinterest, and Tumblr. Using these 3 methods, we can build more traffic than my current stats. Thanks for the good insight that it does work. Congrats. Wow. It is your first step to success. I visited your blog and I like the design and content. It is the reason, which I think to decrease the bounce rate. I followed very simple steps to build targeted traffic to my blog. Great results for low traffic volume. You've proved your business model so all you need to do now is scale up. Good to see that you have low bounce rate and your making income from your blog. I wish you success. Congratulation! I have also just started a blog, but for many month there is no sales and no optin, even Adsense has banned my account. Every month I am just paying for web hosting and auto-responder for nothing. May I take a look at your blog? Did you publish this post on Shoutmeloud? Wow!!!! WoMaster The Article Was Quite amazaing And Inspiring. Thanks for your step by step explanation. Nice!.... Depending on the niche, you may consider starting to collect email and sending them an automated followup system to increase your conversions. I believe that with the traffic you have right now you can make much more money. Yeah.. Building an email list is very important. I started a campaign with optinmonster. Do you have any tips to build email list as soon as? Congratulations! Glad to see you get such great Google Analytics reports in the first month of your blog. Building targeted traffic to new blog is very difficult. Do you have any experience about it? My current traffic is from search engines, social media and referrals. All of them are free traffic. About 50% of total visitors come from Search engine (Google). About 25% of total visitors come from referrals. And others are from social media, email subscribers, direct and others.. I checked your site with alexa. Good ranking. That is a great start. Your bounce rate shows you are doing something very, very right with your content. Keep up the trend and you can turn it into a full time income! Are you using the Wordpress SEO plugin by Joost de Valk? Congrats! Hope you find continued success. Yeah. I'm using it. It is very useful plugin to customize and improve rankings. What are the methods that you used to build targeted traffic? Wow, that’s a big earning for a first try in blogging. Congratulations. I wonder what kind of blog you have to get such good traffic. I know a lot who tried to earn income from blogging but fail to generate good amount for almost a year. Some even stop trying to earn from blogging while others tried different strategies to generate traffic. I would love to hear your story. Pretty awesome! Glad to hear you've done a great job and are able to earn in just a few months! Thanks for the tips here. Will definitely try it on my own too. Thank you. Good job! Build authority and always stay white hat (so your venture will be sustainable) and keep scaling up! Great job! Soon you will be making $125 per day! Congrats! You could also consider expanding to youtube I heard of a product recently that converts articles to video so your favorite blog posts you may consider doing that. Congrats! What affiliate network did you use? Clickbank? on your path we are taking !! What are the best traffic building methods for beginners? Wow, That is impressive $125! I have made about $40 in my first 2 months so hope to get there. Just stay with it... youll get there! how often do u blog during the start, and now? so a few month later, how are you doing at this point? I didn't knew you were on WF Nilantha. You are in my list of bloggers who I like to read when I have time to spare. I am a long time lurker of your blog and you are right, the long detailed case studies are a major part of your success. Keep them comin'. Congratulations. Keep up the good work. Hope you ad a few zeros to that earning. What's the situation now, if its not a secret ? Did your earnings increase or? Keep doing this.. In my first month, i got nothing. After that, i made about $200 per month.. I'm trying to increase it. so u mean affiliate gives better earning than adsense? It depends on the affiliate offer you're signed up with. Adsense pays per click or $1-2 per 1000 views. With a good affiliate offer, you may get $50 commission per sale. I've even heard of people giving away $500 commission per sale. Congrats, $125 is definitely a great first income, only thing you need to focus on now is scaling it like a mad man! I have a question that maybe someone here can answer for me, What I am trying to do is get my beard oil out on the market place and need to know how to go about setting up a blog. Wow! Congratulations! Which affiliate websites do you use? Which countries most clicks adsense? It is just like an impossible thing without using adsense. wow thats impressive mate keep it up! That's a really low bounce rate, Your posts may be very engaging. what affiliate marketing do you use? well done you! Congrats!!! Now, focus more on secrets or strategies used to earned your first blogging income and improve on it to earn more. Congrats, nothing feels better than generating your own revenue.